Writer-director Julia Hart’s FAST COLOR isn’t the sort of film one can nail down in terms of its genre. With its wonderfully rich world-building and delicate character relationships, its mix of superhero sci-fi, familial drama and western influences form a unique identity. 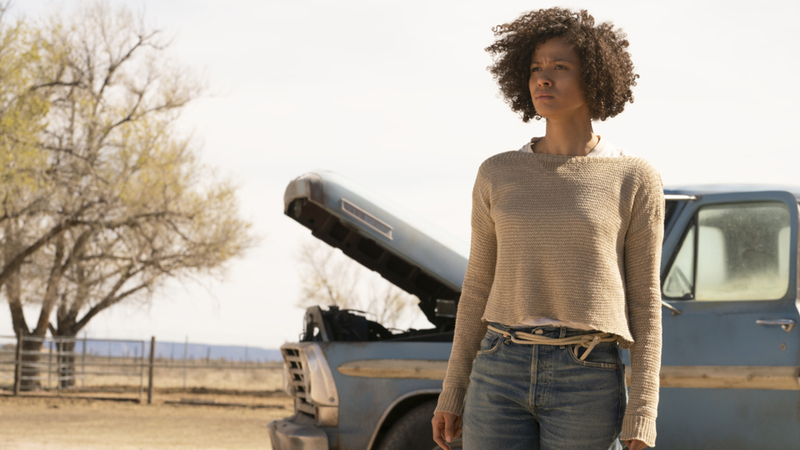 And there’s no one better to bring the role of Ruth – a woman on the run forced to return home to reckon with her inner demons and her past – to life than Gugu Mbatha-Raw. From BLACK MIRROR’s “San Junipero,” to BEYOND THE LIGHTS, she consistently delivers strong, multi-faceted performances. At the film’s recent press day, I spoke with the immensely talented actress about everything from how method she got, to what appeals to her about the sci-fi genre, to the arresting visual landscape Hart created – particularly being a woman of color in this type of film. When you first got this script, what was it about it that resonated the most with you? I was in the middle of CLOVERFIELD PARADOX, which was mostly shot on a soundstage and a lot of CGI. It was all inside and intense claustrophobic energy to it. For me, to read something that was set in desert and much more paired down, about intimacy, family relationships and the nuances was something much more grounded and raw, was really appealing to me. I’d done a couple of movies that were grand scale with special effects, like WRINKLE IN TIME, which were all amazing experiences. But I always try to do something than what I’d done previously. This to me was such a refreshing contrast. The world that Julia created – I was really drawn in by the character of Ruth, who is seemingly a woman on the run. I loved her wild adrenalized fight or flight energy that she has. She’s a woman who is desperate and will do anything to survive. I thought that was intriguing. When the movie takes a turn and arrives at her mom’s house, I thought was so interesting. This is the point where movies usually end. This is where everything really starts to get interesting. I thought, “Oh. Okay. This is really something different.” I loved that it challenged the idea of, “What is the hardest thing?” It is the hardest thing to go home and confront family and repair relationships, deal with your past and heal your demons. That’s often far more challenging than reinventing yourself in the wilderness. Coming back to the people who created you and know you is much more vulnerable. I also loved that this was a story about three generations of women with these special abilities. It seemed mythic. What was it like to collaborate with Julia, bringing this character to life? Julia had such a vision for this movie. Talking to her about her inspirations – the themes of mothers and motherhood. Julia hadn’t become a director until she became a mother. So often we’re conditioned to believe motherhood is the time when creativity powers down and you give over your whole being to this other person. For Julia, it was really a time for creative inspiration. She wrote this script after she’d given birth to her first child. Julia works very closely with her husband Jordan Horowitz. It was fascinating to see them, as partners in life and partners in work, work on a film about family. The set was very familial. Lots of the time we were in that farmhouse, it did start to feel like one big extended family. Both Julia and Jordan have such an eye for detail building the world – the clothing being threadbare and visuals, how it was grounded and desaturated. This drought that we’re facing and that these women haven’t connected fully to their creative force. 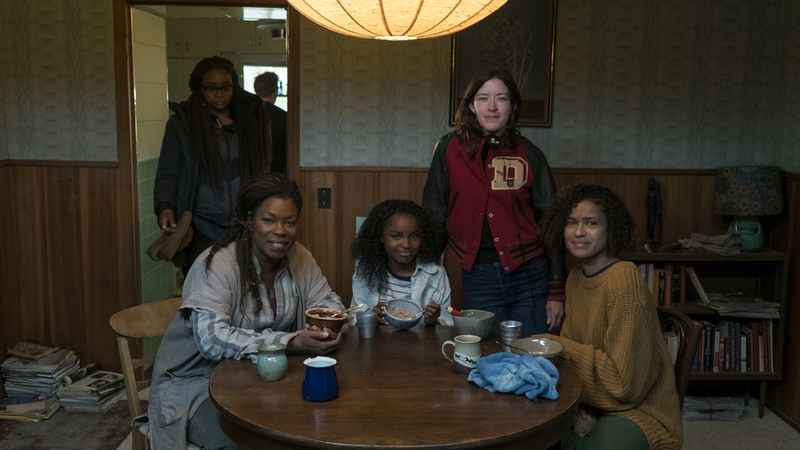 Lorraine Toussaint, Saniyya Sidney, Julia Hart and Gugu Mbatha-Raw from the set of FAST COLOR. Courtesy of Codeblack Films. What, did I not wash ? [laughs] No. I’m afraid I wouldn’t survive in a drought. I do love a bath [laughs]. When we were out in the desert, it was so dry. My skin was dry. I would constantly be moisturizing and chugging water. There would be dust storms. It’s such an airid landscape out there. You’re also at quite a high altitude in Albuquerque, so it takes a while to adjust – especially when you’re running through the desert. That was the first day and I was not adjusted and it was really exhausting. So no, I have to say, I really relished my Epsom bath with my aromatherapy candles at the end of the night. This role is a little physically intense too. How did you prepare for the physicality required? To do those seizures is pretty tough on your body. Yeah. I didn’t really think about it and then suddenly I’m doing it and it is a lot of energy, to manifest something looking like an epileptic fit, or at least what I’ve seen from someone fitting. When it was the real seizures, that was enhanced by visual effects, in camera work as well. I always try to maintain a certain level of physical flexibility. I do a lot of yoga and stretching and find that deep tissue massage really helps me when I’m working to release tension. We did work with a stunt coordinator for some of the sequences, when Ruth is jumping out of a car, or running to escape into the desert. That was fun to have that physical element. It’s so much part to who Ruth is. She’s had to be so tough for so long, but actually she’s incredibly fragile. It was also down to the clothes and boots to find her physicality – how she would hold herself as somebody who is ready to run at any moment. That adrenalized energy I tried to put into her physical body. We also worked with the idea that she’s an addict in recovery and she’s on a program. I looked at the 12 Steps for Alcoholics Anonymous and some of the literature around that. Having that meditative serenity prayer, where she’s cross-legged, feet are bare, where she’s able to center herself in a safe space. There was that shift from being in the wilderness to being in the farmhouse. You’ve been a part of a few female-driven sci-fi, or sci-fi tinged films. What do you think it is about that genre where those really great roles for women exist? For me, it’s really about the best, most complex characters. Julia was very keen to, certainly in this world of the wild west, to take that very male iconography of the Western almost and put a woman in that place – and how is that? How does that feel? We looked at movies like NO COUNTRY FOR OLD MEN, visually. Putting women in that landscape is arresting because we’re just not used to seeing it – and especially women of color in the desert. That’s not something that’s very common in movie history. I’m always down for celebrating that and the nuances of these characters. The relationship between you and Lorraine Toussaint and you and Saniyya Sidney, all three of you are amazing on screen. How did you all work together to create that bond of estrangement? Yeah. It was all on the page. I didn’t want to rehearse with Saniyya [laughs] and normally I’m all down for rehearsal, but I was saying to Julia, I wanted to preserve that energy of the not knowing for us to discover that relationship onscreen. They are unsure of each other. Ruth is scared of stepping into that role of being a mother. She’s scared that she’s going to mess it up again. She doesn’t know if she has the maturity to be that for her daughter. We discovered that on set. Since your character has some abilities, if you could have some superhero abilities in life, what would they be? [laughs] I think it would be really cool to fly. That would be so much fun. Maybe even just to be able to teleport because the amount of time that I do spend criss-crossing the Atlantic and in planes. Just to cut the jet lag would be a great superpower and would make my life a lot easier. FAST COLOR opens on April 19.